One of the biggest myths about exotic deck woods is that they never rot. It’s not something we see every day, but it does happen. 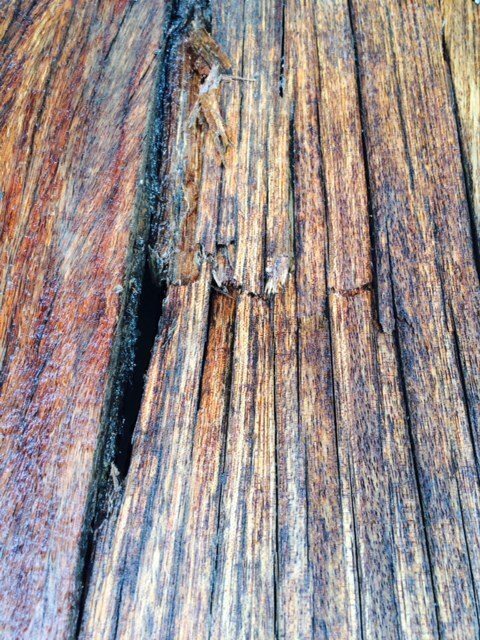 All wood is capable of rotting. That’s what keeps it interesting. A handful of contributing factors have to converge for exotic deck wood to rot, and about a decade of time. The deck in this case study is not IPE, it is a close cousin: red meranti, a very dense Philippine mahogany. 8 boards replaced, oil applied. This deck was not only visually unappealing, it was unsafe. The thought of anyone stepping through a deck is just not ok. The homeowner was pretty sure that the entire deck, 14 years old, should just be removed and replaced. After reviewing the unfavorable maintenance history of the deck, I was still confident that we could save it. But you never know until you get into something like this: it is exploratory surgery. How Do You Clean Such a Rough Deck?